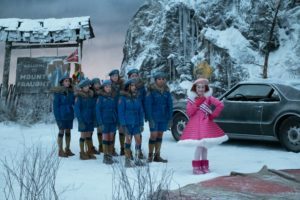 A Series of Unfortunate Events picked up where it left off, with Klaus and Violet Baudelaire hurtling to their apparent deaths on the Mortmain Mountains while Count Olaf, Esme Squalor, and their troupe held Sunny hostage. But once again, thanks to the resourcefulness and quick thinking of the eldest Baudelaires, they escape death. Meanwhile, Sunny strikes up an unlikely friendship with the Hook-handed Henchman, who proves that there is more to him than just being Olaf’s lackey. 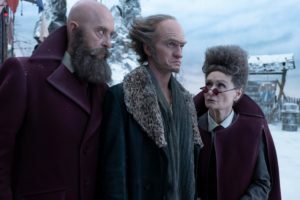 The final season of A Series of Unfortunate Events is the best of the series as it not only focuses on the growth and resilience of the three Baudelaires, but also gives such much needed depth and background to Count Olaf, Lemony Snicket, and new addition, Kit Snicket, who is on her own journey to protect the sugar bowl. New characters are introduced, some friends like Quigley Quagmire, who aids the Baudelaires in climbing the waterfall to rescue Sunny and who makes a connection with Violet, and some more sinister foes in Olaf’s mentors, the Man with a Beard But No Hair and The Woman With Hair But No Beard. Carmelita Spats is also back, and as horrible as ever, leading a hapless group of Snow Scouts as they try to celebrate False Spring. The Slippery Slope is an action-packed chapter that also reveals more about the backstory of the mysterious organization VFD. But since this is A Series of Unfortunate Events, every step forward the Baudelaires take only forces them to take even more steps backward. They meet Quigley and find the headquarters of the VFD only to see that it has been recently been burned to the ground. They capture Esme Squalor (who sports a fabulous fire-themed outfit) and try to exchange her for Sunny but they fail to stop the villains from capturing a group of rich children. Kit Snicket shows her daring and ingenuity but still fails to hold on to the precious sugar bowl that is so important to the VFD and that Esme Squalor is obsessed with. She wanders the mountains and somehow bumps into Mr. Poe, a permanent fixture in A Series of Unfortunate Events and someone whose paths seems to cross with the Baudelaires on a regular basis. But for once, it’s not only the Baudelaires who suffer misfortunes this time around. In addition to having his latest schemes thwarted (yet again), Count Olaf also has to contend with the bitter disapproval of the parental figures he is so desperate to impress as well as the abrupt abandonment of everyone in his acting troupe except for the Hook-Handed Man. His once-loyal followers realize finally question their life choices and realize how poorly they have been treated by their boss all this time and how bleak their future will be if they continue to stay with him. Only Hooky remains but even he has begun to question his choices, especially after he bonds with Sunny and even saves her life. His own story will be more interesting in the next episodes but it was good for some groundwork to be laid as early as here. One great thing about this season is the exploration of moral ambiguities and gray areas which challenge one’s definitions of the heroes and villains. There are some moving moments in these episodes, some between Hooky and Sunny, one between Violet and Quigley, and the most significant being Sunny’s tying up of her hair with a ribbon just like her elder sister. Violet realizes that her little sister has grown up so fast in such a short time and is willing to risk remaining a captive to discover the sinister couple’s plans. In the end, the Baudelaires are unable to stop the villains but they still manage to escape down the slippery slope. Sadly, they lose Quigley who promises to meet them at the “last safe place” where all the noble members of the VFD are being summoned. The three orphans finally land on top of a submarine with the VFD logo while Olaf, Esme, Carmelita, and Hooky make plans to pursue them, and the adventure continues.